Simon & Schuster/Paula Wiseman Books, 9781481429139, 40pp. Yes, bears sometimes eat squirrels. But can they still be friends? Find out in this clever picture book that’s perfect for preschoolers. Deb Pilutti is the author and illustrator of several books for children and has worked as a design partner at Oliebollen.com, where she designs toys and products for kids. Her design and illustration work has earned her many awards and has been published in several magazines including Step Inside Design, HOW Magazine’s Best Digital Designs issue, and Print magazine. She enjoys spending time in the woods near her home in Michigan. Visit her at DebPilutti.com. They might look very different, but Bear and Squirrel are friends. They both like to gather blueberries and acorns for supper. Bear helps Squirrel build his home in a tree. Squirrel helps Bear keep his den clean (fluffy tails make great dusters). And both of them enjoy playing games. Squirrel's squirrel friends ask Squirrel if he is worried Bear might eat him for a snack. "Don't be silly!" Squirrel scoffs. Bear's friends suggest that Bear might find Squirrel a tasty snack. "That's ridiculous!" Then Bear settles in for a long winter nap, and his friend settles in to wait, knitting a prodigious scarf as he does so. When Bear finally wakes up, they're glad to see each other…but they seem different. Bear looks very toothy, and Squirrel—well, Squirrel looks delicious. To the starved Bear, Squirrel actually looks rather a lot like a cupcake. Bear just can't help himself. There's much chomping and chewing, and Bear apologizes…for eating all the pancakes. Whew. Graphic designer Pilutti presents an unconventional friendship tale in a mix of full-bleed and spot illustrations with a smattering of dialogue bubbles that fit seamlessly into the story. The muted palette and flat, cartoon style work well with the silly, affirmative tale. A nifty, expectation-defying read-aloud. Given the title, there’s no chance Bear would ever want to eat Squirrel, right? Just look at the way that Bear shakes acorns out of trees for Squirrel, and how Squirrel lets Bear use his bushy tail for a dust mop. Their friends, however, remain unconvinced. Squirrel’s fellow squirrels are horrified, while Bear’s pals savor fantasies of eating Squirrel in popcorn, in soup, or even in a sundae. Then comes the ultimate test: Bear goes into hibernation (Squirrel patiently knits a scarf that gets longer and longer) and wakes up feeling as hungry as, well, a bear. Can the friendship—and Squirrel—survive? With toylike drawings, sophisticated characterizations, and sly visual jokes, this very funny story tests and tickles readers’ faith in unlikely friendships before ending up right where it should, thanks to a little narrative misdirection and a Squirrel who knows his friend all too well. Yes, Pilutti (Ten Rules of Being a Superhero) is messing with her audience’s minds, but they won’t mind one bit. 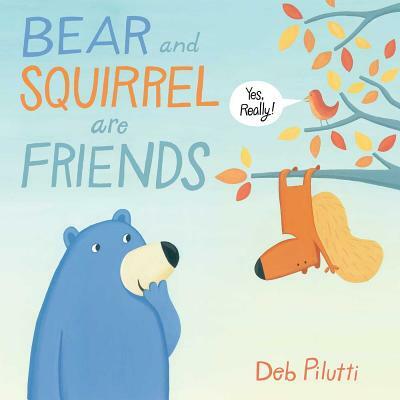 In this gently teasing picture book, Bear and Squirrelare unusual friends who help each other out. Bear shakes trees so that acornsfall down for Squirrel, and Squirrel helps Bear with some household dusting,but they also play games and have fun together. The other bears and squirrelsdon’t get it—the other bears think Squirrel would be a great snack, andSquirrel’s friends worry he’ll get eaten. After a long winter of hibernation,Bear awakens and sees Squirrel as a cupcake, and tells Squirrel how delicioushe looks. After a few ambiguous and terrifying moments where Bear declares thathe can’t resist, readers learn that Bear has eaten the blueberry pancakesSquirrel has made without saving any. Bear and Squirrel’s friendship is sweetand endearing, but their story is also full of humor, such as when Bear usesSquirrel’s tail as a feather duster, Bear’s dream bubbles show sandwiches andpizza, and he literally sees Squirrel as a cupcake. The clear, simpleillustrations are drawn in muted pastels. Children will laugh at the story andperhaps even learn about being a good friend. This comical take on an unusual friendship offers lessons in resisting peer pressure and temptation. The story starts by acknowledging that bears will sometimes eat squirrels. But this particular Bear and Squirrel, first shown exchanging a blueberry and an acorn, are friends. They have fun together, chatting on tree trunks or playing hide-and-seek in the forest (though Bear is pretty easy to spot). They help each other out—Squirrel uses his tail to sweep Bear’s den; Bear shakes trees till acorns fall down. But the other bears think Bear is missing out on a tasty snack, and the squirrels think Squirrel is playing around with a killer. The big test comes after Bear wakes up from hibernation and sees Squirrel as a delicious cupcake. Gouache illustrations in gentle colors soften the somewhat scary premise and keep humor at the fore. Readers will love the suspense of the final pages, the resolution of which is a resounding endorsement for friendship through thick and thin (and hunger).